Farmers and FFA students team up to deliver more than 10,400 pounds of food to benefit Grand Island-area rural families. The America's Farmers Food Drive, held at Husker Harvest Days in Grand Island, Neb., collected a record amount of food donations this year. Farmers and FFA chapters visiting the show donated 10,411 pounds of food and more than $700 in cash. With the $1 per pound match from Monsanto, the food drive raised the equivalent of 11,138 pounds of food for needy families in the Grand Island area. COLLECTING CANS: Area volunteers worked hard during the 2011 Husker Harvest Days collecting food for Grand Island area food shelves. The set a new record for the drive this year. Monsanto Company teamed up with Farm Progress and the Heartland United Way for the America's Farmers Food Drive to benefit local food pantries. One in seven rural households struggle with hunger and an estimated 2.8 million households in rural America need food assistance. All donations will benefit the Central Nebraska Community Services, Crisis Center, Hope Harbor and Salvation Army pantries. Each pantry serves approximately 300-500 individuals per month in the Grand Island area. "As a company that focuses solely on the agriculture industry, Monsanto is keenly aware of all that America's farmers do to feed our communities. We wanted to honor that with the America's Farmers Food Drive," explained Linda Arnold, Monsanto Customer Outreach Lead. "And just as America's farmers meet the daily demands of a growing population, the farmers and FFA students visiting Husker Harvest Days rose to the occasion again and donated an astounding 10,411 pounds of food." 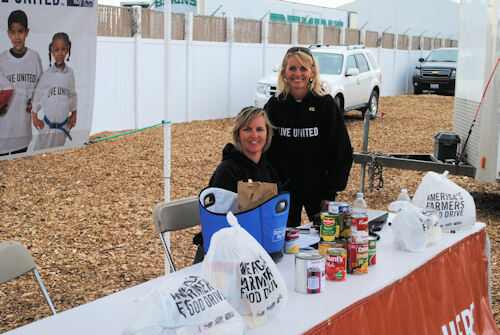 United Way volunteers collected food and cash donations throughout the three-day show. Nebraska FFA students donated more than 5,300 pounds of food. Students from the Ravenna FFA donated the largest amount of non-perishable food with 245 pounds. In addition, local grocery stores including Skagway, Hy-vee and Super-Saver collected food to support the drive. This is the third time for Monsanto, Farm Progress and United Way to co-host a food drive at Husker Harvest Days. "Farm Progress has a long-standing dedication to rural communities and is proud to work with Monsanto to help meet the needs of the area food shelves and the residents who benefit from this program," said Matt Jungmann, Farm Progress events manager. "We look forward to working with Monsanto on related projects during future shows, as well." At the conclusion of the show, Monsanto also donated more than 3,000 pounds of watermelon and 155 pounds of sweet corn to area food pantries. .
With a stable of 19 magazines, four industry-leading farm shows and a wide array of multimedia tools targeted at agriculture, Farm Progress is the largest publisher serving farmers across the United States. To learn more about the information provided to our readers, visit www.FarmProgressDaily.com. With titles that started as far back as 1841, Farm Progress has a long-standing history of service to the agricultural community.